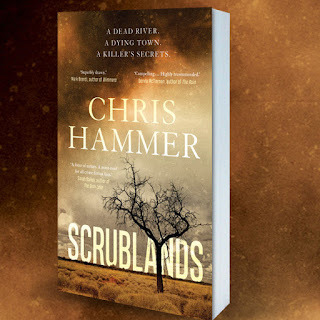 There's a rhythm to Chris Hammer's Scrublands that could easily have become monotonous in the same way driving to and from the small parched town of Riversend to the larger river town of Bellington again and again could be monotonous. Except that both rhythms are edged with beauty and tragedy and cornered by the possibility of salvation or damnation which is why we are often addicted to the most monotonous things. Post Gaza Strip foreign correspondent Martin Scarsden is sent to Riversend by his old-school editor Max Fuller who knows there's a half decent headline in revisiting the horrors of a churchyard massacre on its one-year anniversary. At least equally as important to Max is the hope that it will provide a gently-therapeutic return to form for his star reporter. After all, having done a stint or two in the role, I've always believed editors of newspapers were print-pastors at heart - of their readers' weeping and rejoicing certainly, if not also of their lost sheep staff. It is no coincidence that two Cread reviews in a row are of books set in the drylands of Australia's interior. This is where our collective hearts have often strayed for meaning, with our longing voiced by the likes of Charles Chauvel, Patrick White or even Harry Butler. And following of from Tim Winton's Fintan MacGillas in The Shepherd's Hut, we have an equally mysterious, though better looking, priest - Byron Swift. Except Byron's sin is no secret (although his origin is): he stepped out from the vestry before church one Sunday and shot five of his parishioners with remarkable accuracy. And so the scarred son Scarsden arrives nearly a year on to see how the Riverina town (and himself) are coping and discovers almost nothing is as it seems - except the relentless asphalt-melting heat and the sardonic temperament of the owner of The Black Dog motel. Never in a hurry, Hammer keeps us engaged with layered revelations, surprising action and (mostly) unforeseen plot turns to ensure his descriptions are atmospheric and not atrophic. The detailed meanderings through this archetypal small rural town (the club, the store, the quiet main street and the newly come coffee shop) reveal the author's country affinity while his journalistic descriptions draw realistically on his reporting career. (His work has been likened to Peter Temple's The Broken Shore and he may well have sat under Temple as a student in his university days). Despite an Anglican priest, a chaplain and a church congregation being at the centre of this story there is not a recognisable Christian anywhere, in the sense of someone actually living what they believe sincerely, even in the secret places if life. But this is an accurate portrayal of much of our culture's engagement with religion (and view of Christians). We tolerate religion on Sunday, want no interference on Monday, hate it with a passion when it let's us down and revel in surprised gratitude when it actually outworks kindness, warmth and love. Byron is stubbornly well-liked despite his many indiscretions, massacre included. But he is no Christ figure. Ultimately he is more Pilate - washing his hands of the mess with a shotgun. If Christ is to be found, I think this role is reserved for the solitary bronze soldier of the Riversend war memorial, always present, always carrying his sacrifice and remembered about once a year. This may become a seminal Australian story and if not, it is at least a bloody good read.